One of the most read articles on MINING.com in 2018 is headlined: This is the only chart lithium price bears need see. The piece highlights a slide from an Orocobre deck showing just how large the gap is between expectations of new supply and the reality of bringing lithium projects into production. It could not have been Orocobre’s intention, but the Brisbane-based company’s Argentina venture became the poster child for the challenges faced by new brine projects. Salar de Olaroz eventually took seven years to hit its stride. The delays, run-ins with courts and regulators, not to mention mutual accusations of licence violations, Chile giants SQM and Albemarle are dealing with in the Atacama only reinforce this point. After a dramatic retreat since the first quarter, lithium carbonate and hydroxide prices have now at least stabilized. That’s mostly because the shake-out among Chinese converters and processors (responsible for over 80% of the global industry) seem to have run its course, but also because the South America brine problems diminished fears about a flood of new supply. But brine production is only half the story. Or more accurately, less than half the story with the vast majority of new lithium capacity coming from hard rock mines. Altura Mining’s first concentrate shipment to China marked the third new Australian spodumene operation to enter the market this year. Altura’s Pilgangoora mine took just 18 months to construct and follows new supply from Pilbara Minerals and Tawana Resources. Galaxy’s Mt Cattlin is ramping up as is Mineral Resources’ Mt Marion. Another sign of the shift in the industry is Albemarle’s investment in Mineral Resources’ Wodgina project for $1.1B which follows SQM’s own Australian diversification with the acquisition Kidman Resources’ feasibility stage project. If the message wasn’t clear enough, Albemarle announced last month it won’t expand in Chile at all beyond 2021. In stead the Charlotte, North Carolina firm will pour resources into the grand-dad of hard rock lithium mining in Australia, Greenbushes, where capacity is doubling and a $1B hydroxide plant was greenlighted this month. By 2025 Australia could account for 51% of global output. Currently China holds that position while Chile and Argentina together account for 43% of world production. Outside Australia Canada’s Nemaska Lithium and Brazil’s AMG also entered production this year. While generally higher on the cost curve than brine operations (with Greenbushes a notable exception) spodumene concentrate is converted into battery-grade lithium hydroxide. Pumping and evaporating brine solution produces lithium carbonate which sometimes requires further refining or conversion to feed into the battery supply chain. UK-based consultants Roskill predicts annual growth of nearly 39% through 2031 for hydroxide compared to 13% CAGR for lithium carbonate. Total consumption of hydroxide is expected to rise four-fold versus carbonate, with demand climbing to 1,605,500 tonnes and 460,100 tonnes respectively by 2031. 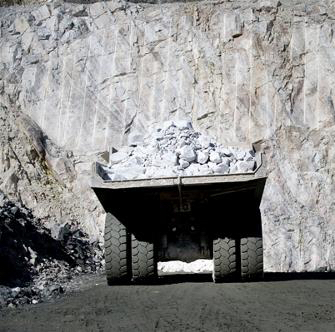 According to Benchmark Minerals data lithium hydroxide inside China goes for around $18,875 a tonne, while the midpoint price of battery grade lithium carbonate has fallen to $11,500 a tonne. In March carbonate ex-works in China was sold for $24,750 compared to $22,000 for hydroxide which was even cheaper than non-battery grade carbonate. 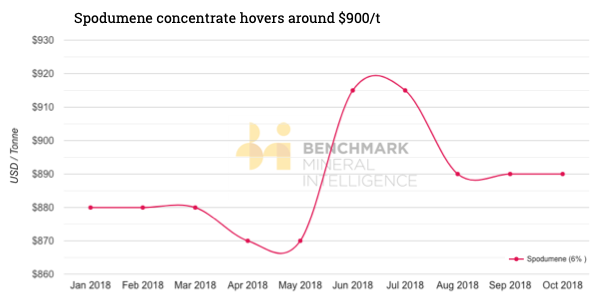 Spodumene (6% concentrate free on board Australia) has been either side of $900 a tonne throughout 2018. And clearly that price has been more than enough incentive to build new mines.